With 2017 upon us, you may have started making a list of the national parks that you want to visit in this upcoming year. You may not know this yet, but the coolest trails and cabins need to be reserved months in advance. In addition, you have to win a lottery to visit our nations most prized treasures. Hopefully I can shed some light on this process. The most useful information about each individual permit—such as lottery win % by date—are located on the National Park Service website. Links to those pages are included below. While there are dozens of permit lotteries, two mountain permits stand above the rest. The Half Dome Cables are one of the coolest and most extreme hikes that a non-expert can make in the United States (pictured above). The top 600 feet in elevation are traversed by pulling yourself up two steel cables while other hikers are trying to make their way down those same two steel cables. You can see the valley floor about a mile below. The entire round-trip hike is about 18 miles in length with about a mile in elevation change. TTM on the summit of Half Dome facing south, toward Mount Whitney. I hiked Half Dome in 2015 and the views were amazing (full post to come soon). Even with strategically choosing the lottery days to maximize our winning potential, we still lost the preseason lottery. Thankfully we won the daily lottery two days prior to our trip so we were still able to hike the mountain. Early May and during the week in September appear to be the best dates to target. It’s important to keep in mind that your Yosemite experience will be vastly different depending on the time of year that you go. The waterfalls are amazing in May but they have mostly dried up by September. Mount Whitney is the tallest mountain in the contiguous 48 states (Denali in Alaska is taller) and it is located between Death Valley and Yosemite Valley, in California. 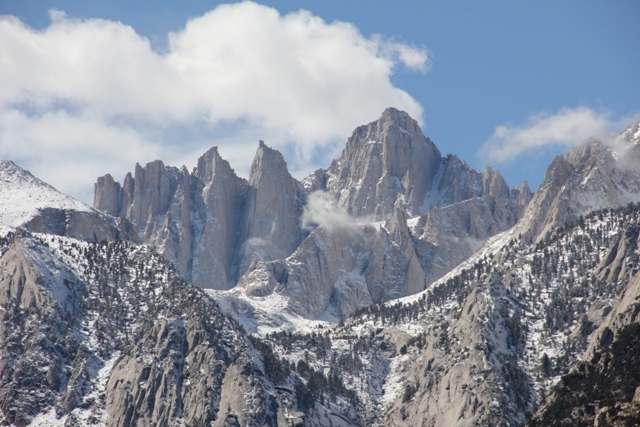 Mount Whitney is an attractive mountain to hike because it does not have a snow/ ice glacial tip that other tall mountains have. Given that I’ve already hiked Half Dome, I hope to win the lottery for a permit to hike Mount Whitney in 2017–I applied in 2016 but did not win the lottery. Mount Whitney is the tallest mountain in the picture. You sign up for the preseason lottery at www.recreation.gov between now and March 15, 2017. There are two types of permits: day use (100 permits available per day) and overnight (60 permits available per day). If you receive a day use permit, you hike the entire mountain in one day. These hikes usually start around 4 am and conclude late that night. Overnight hikes allow you to camp and split the hike into two days (not evenly). There is a $6 application fee and if you win the preseason lottery, reservations are $15 per person. In 2016, 36% of day use applicants and 46% of overnight applicants won the preseason lottery and received permits on their preferred day. Early June and late September (unless if you want to hike during the week) appear to be the best dates to target. This strategy is risky though because there’s a chance that the highest elevations of Mount Whitney may still be snow-capped which would make submitting much harder. 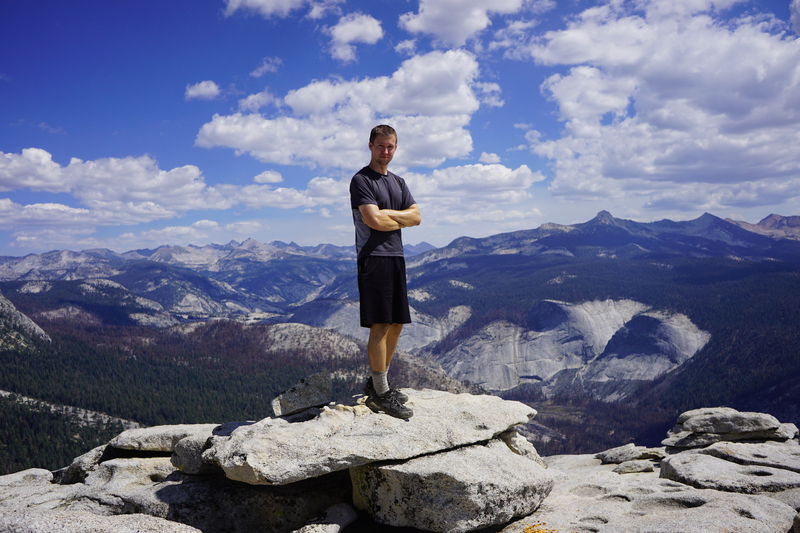 For the meager fee of $15, hiking Half Dome or Mount Whitney is one of the coolest things you can do. The only downside is that you have to plan in advance–so get started soon! I hope to win the Mount Whitney lottery this year so my fingers are crossed. Be the first to comment on "2017: Winning the National Park Lotteries"